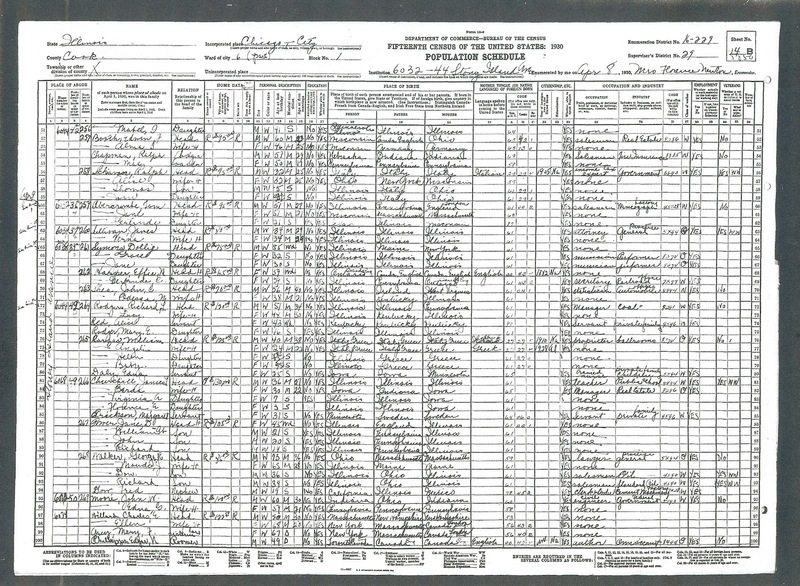 In a snapshot of Ralph and Alice Schiavon and their two children, five year-old Thomas and 21-month-old Joan, the 1930 United States Census shows us that less than a year after the stock market crash of 1929, the Great Depression had not fully impacted the family yet. On April 8th of that year, we can see that they were renting a second-story apartment for $95 a month at 6044 Stony Island Avenue in the middle-class neighborhood of Hyde Park, on Chicago’s South Side. Ralph and Alice (my maternal grandparents) were one of the younger couples in the complex. Only two other couples were anywhere near their ages, and the rest were mostly ages 50 and above. Alice must have lied about her age, as she claims to be 32 years old, the same age as Ralph. According to her birth certificate, she was born in 1895, making her, in fact, two and a half years older than Ralph. At the time of the census, she was two months away from her 35th birthday (June 14). The Schiavons were part of the 40% of Americans who owned a radio at the time. This was something of a luxury, as radios were fairly expensive, even during the early years of the Great Depression. Only a year earlier, a radio set cost about $139 – a fairly steep amount of money for a family struggling to pay their bills and put food on the table. For this reason, many families paid the cost in monthly installments. Despite the sacrifice, the payoff was rewarding: radios provided news and entertainment to families on a tight budget and brought them together nightly to share experiences as they listened intently to serial dramas and comedies, musicals, and concerts. Though the census clearly indicates that Alice was the homemaker (see the “H” beside her name), it goes on to list her occupation as “none” – something we would never find in our modern-day census. Today, most women would object loudly to having that “H” made a part of their very identities, yet I remember hearing from my mother and my aunts that there was a time when women took great pride in this emblem. When it came to my grandmother Alice, the “homemaker” label would have been a bit less traditional in nature. She disliked cooking but loved a good meal, and she enjoyed many of these thanks to my grandfather Ralph, whose mother, Emanuella Schiavone, had taught him to be a gourmet cook. My mother, Joan (Schiavon) Huesca, used to tell me that Alice also appreciated beauty and kept a meticulously lovely home. She was independent in mind and spirit and taught her children to “dare to be different.” Although she tried her best to be a good homemaker, she could not stay at home for long but needed fulfillment elsewhere. She had many interests that grew over the years: doll and stamp collecting, crafting, antiques, and traveling – and all the adjunct activities that went with these hobbies. She became a renowned expert on dolls and stamps and amassed large collections of both. My mother and her sister-in-law, Angelina (Ciliberto) Schiavon, used to say that my grandmother was happiest when she was writing one of her newsletters, speeding around Chicago in her Ford, or out and about on one of her shopping expeditions, always in search of the perfect addition to her collections. Perhaps today Alice would have called herself a “multi-tasker,” curator, and connoisseur – neither being occupations per se, but accurate descriptors, nonetheless. 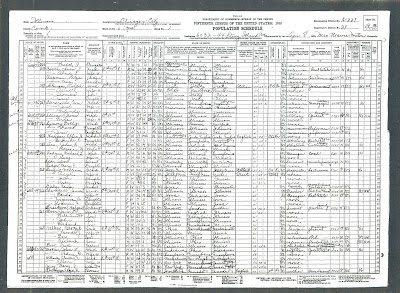 The census also confirms for us that Ralph, who was born in Italy, came to America in 1905 (when he was 7 years old), was a naturalized a citizen of the United States, and a World War I veteran. It lists his occupation as an “income tax expert” working in “government” (in his case, the Internal Revenue Service, where he was a supervisor). The “expert” qualifier demonstrates some ambition. Was he already preparing himself to go into business for himself? Whatever the case, his chance was to come soon.